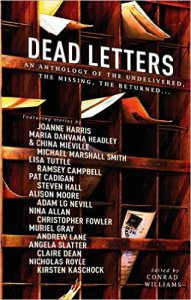 I'm delighted to have a story in this new anthology masterminded by Conrad Williams, who sent each contributor a mysterious package by post to inspire them. There are some great teasers for the stories collected on Conrad's blog. I still have the book he sent to me. It's in its battered envelope in a box under my bed. I unnerved myself so much writing the story for it that I don't want to see it, but can't get rid of it either.